Greek, Mark-Anthony Turnage’s 1988 operatic setting of the Oedipus story, is set in the gritty, seething political turmoil of 1980s London: the era of Thatcherism, of extreme political and social changes, and of artistic and cultural revolt. The prosperity and triumph of capitalism that marked Margaret Thatcher’s time as Prime Minister from 1979-1990 were not without cost or controversy—especially in the arts. 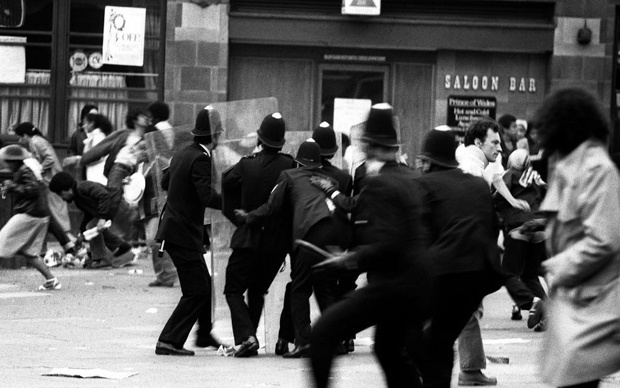 During the winter of 1978–79, disputes between unionized workers and Prime Minister James Callaghan, of the Labour Party, led to a series of strikes that crippled the British economy. Demanding that the caps on their pay raises be lifted, public sector unions that went on strike included lorry drivers, train drivers, nurses and ambulance drivers, gravediggers, and—crucially—waste collectors, leading to huge piles of rubbish and trash in London’s posh Leicester Square. All of this disorder, combined with the coldest winter in England in nearly 20 years, hurt the economy and retail spending and brought Britain to a halt. Though the strikes were mainly over by February of 1979, the political fallout cost Callaghan his job, as Margaret Thatcher and the Conservative Party swept to power that spring. Thatcher became Britain’s first female prime minister in May of 1979. She immediately moved to curb the power of the unions, decrease nationalized industry, and promote capitalism. 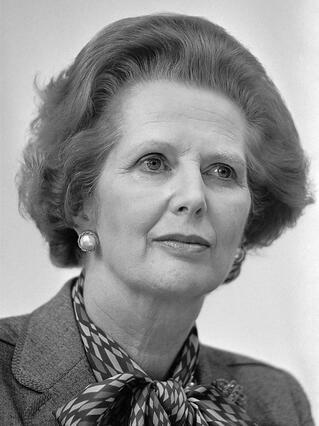 Determined and resolute, her core principles became known as “Thatcherism”—belief in small government, personal responsibility, and free markets unencumbered by regulation. During her 11 years in office, Thatcher emphatically rejected socialism, reducing the British welfare state, breaking up unions and nationalized industries, and touting traditional values and the nuclear family. “I am not a consensus politician,” she declared in 1979. “I am a conviction politician.” Her first term had a fraught beginning. Unemployment swelled to its highest level since the Great Depression, a record number of businesses went bankrupt, and in 1981 riots broke out in the London district of Brixton, the cities of Liverpool, Manchester, Bristol, and more. But with time, the economy began to turn and the middle class swelled as she slashed taxes and subsidies to failing industries, sold over a million public housing units to their occupants, sold state-owned industries to the private sector, and took on the National Union of Mineworkers in an infamous 1984 standoff that culminated in a strike of 362 days. The arts and culture sector did not escape Thatcher’s cuts. She pushed the arts to be profitable and self-sufficient, shifting away from state subsidies to a greater reliance on corporate sponsorship. Britain’s leaders in the arts ridiculed her tastes as provincial, and her focus on commercialism as antithetical to true “art.” Thatcher came to stand in for everything that had gone wrong in Britain in the view of many cultural leaders and the intelligentsia: greed; bourgeois, reactionary tastes and values; and the worship of capitalism. Steven Berkoff’s verse play Greek, upon which the opera is based, premiered in February of 1980—shortly after the Winter of Discontent and Thatcher’s rise to power, but before her reforms began to take effect. As he explained it in the foreword to the play, “Britain seemed to have become a gradually decaying island, preyed upon by the wandering hordes who saw no future for themselves in a society which had few ideals or messages to offer them.” Mark-Anthony Turnage was in his late 20s when he composed Greek, and he described himself at the time as “very anti-Thatcher and anti-Conservative.” There were many disaffected by her dismissal of culture and pushed to the fringes of society by her focus on traditional, reactionary family values, with little tolerance for alternatives outside the mainstream. Turnage’s Greek premiered in 1988, during Thatcher’s third term. She had already gone from underdog candidate to Prime Minister, been lauded as the savior of the economy, been vilified as narrow-minded and unyielding, and taken her place as a world leader. Polarizing and dominant, Thatcher was nothing if not operatic. Lacey Upton is the BLO Director of Community Engagement. This article was originally published in the fall 2016 issue of Boston Lyric Opera’s Coda magazine.